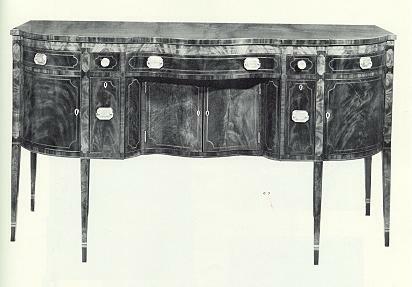 14 Very fine Hepplewhite inlaid mahogany "D" shaped sideboard with serpentine center and recessed cupboard below, the center compartment flanked by bottle drawers with small drawers above; the drawers and doors bordered by double line inlaid panels of contrasting figured wood; retains the original eagle brasses and a beautiful bronze patina. New York, circa 1780-1800. 77 3/4" long, 42 1/2" high, 30 1/4" deep. Photo Credit: American Antiques from Israel Sack Collection - Highland House Publishers Inc., Volume __ , Plate 4668.